Regional Cakeathon B: Bath Buns - Food, Drink, Photography, and other things. We used to occasionally go to a Hamster Show just on the edge of Bath. I would take the bus down into the city centre to explore and do a bit of shopping. One time I went around the Cathedral, another time I walked along the river. There are a few things I would always do though: I would go to the fudge shop and buy a few bars, then to the market where I bought a couple of cakes from one stall and some loose tea from another. I don't remember ever buying a Bath Bun so I can't compare mine to the ones sold in the city but I don't think that will be too much of a problem since the recipe has changed over the years and there are several different versions of the recipe around today. There is a bit of controversy over the origin of the Bath Buns, with some people claiming they were invented by a physician while the Sally Lunn tea shop people claim their eponymous buns are the originals and were brought over from France by Sally herself. This has been called into dispute though, with claims that Sally Lunn is a corruption of the French 'Soleil et Lune', or Sun and Moon. While looking for recipe suggestions, I encountered a few vintage recipes such as the one in The Art of Cookery made Easy and Refined by John Mollard and published in 1802. This used equal amounts of flour and butter and would probably result in quite a rich bun. A version of the recipe published in Cassell's Dictionary of Cookery in 1894 is similar to a modern version published in the Daily Telegraph but with the addition of 4 eggs, which would result in quite a rich cake too. I decided to concoct a version roughly halfway between Cassell and the Telegraph but also to make only half the quantities since enriched breads don't always keep very well and can dry out quickly. Various recipes mention caraway comfits so I attempted to do something similar and make some sugar coated seeds. Put the flour, salt and butter in a food processor, add the sugar and a few caraway seeds then process in pulse mode to form breadcrumbs. Pour into a mixing bowl and add the yeast. Beat the eggs and milk together and add to the bowl. Mix to form a dough, knead for 5-10 minutes (depending on how long you can tolerate handling a rich sticky dough) and leave to rise until doubled in size. Knock back and shape the dough into 6 equal sized balls. Place these on a floured baking tray. 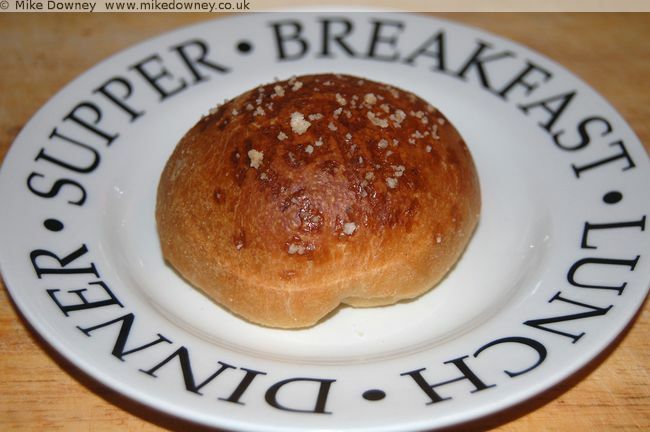 Brush the buns with milk and sprinkle with sugar nibs or the sugared caraway seeds. Leave the buns to rise again then bake at gas mark 5 for 15-20 minutes. Put 5 heaped tablespoons of sugar in a pan, adding just enough water to get it to dissolve (about 2 tbs or so) and heat it gently. Add 1 heaped tablespoon of caraway seeds and continue heating while stirring occasionally. After several minutes, the thick syrup will rapidly change from liquid to crystals. Take the pan off the heat and pour the sugared seeds onto a sheet of baking paper to cool. When I did this, it came out more like a mixture of large crystals and some seeds with sugar attached.